As noted earlier, the ear is composed of external, middle (tympanic) (malleus, incus, and stapes), and inner (labyrinth) (semicircular canals, vestibule, cochlea) portions. See the video below. Ear anatomy. Courtesy of Hamid R Djalilian, MD. The external acoustic meatus (external auditory canal) is formed by cartilage and bone (temporal). The canal measures about 4 cm in length (from the tragus) to the tympanic membrane and is curved in an S shape. The mandibular condyle sits anterior to the bony portion of the external acoustic meatus (external auditory canal). The mastoid air cells sit behind the bony portion of the canal (see the image below). The tympanic membrane (TM) is an oval, thin, semi-transparent membrane that separates the external and middle ear (tympanic cavity). 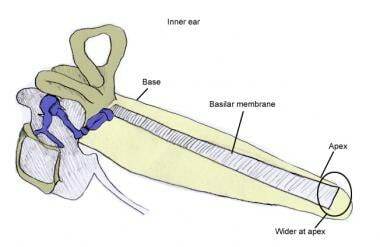 The tympanic membrane is divided into 2 parts: the pars flaccida and the pars tensa. 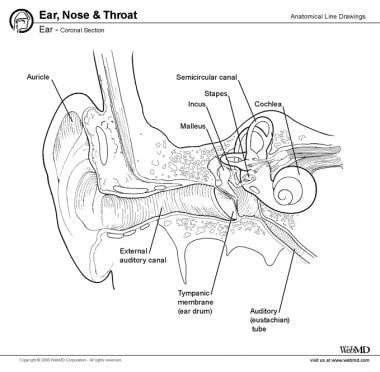 The manubrium of the malleus is firmly attached to the medial tympanic membrane; where the manubrium draws the tympanic membrane medially, a concavity is formed. The apex of this concavity is called the umbo. 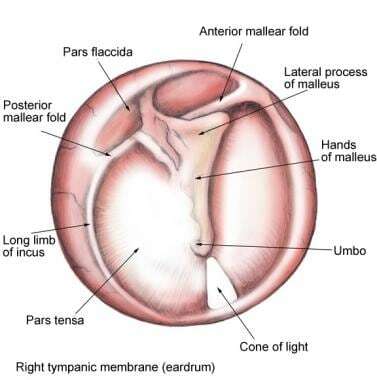 The area of the tympanic membrane superior to the umbo is termed the pars flaccida; the remainder of the tympanic membrane is the pars tensa (see the image below). Tympanic membrane (TM): pars flaccida (superior to insertion manubrium) and pars tensa (remainder of TM). 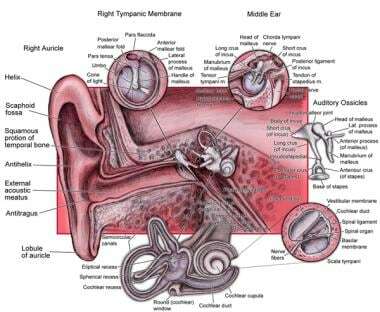 Air vibrations collected by the auricle are transferred to the mobile tympanic membrane, which then transmits the sound to the ossicles. The blood supply is derived from the stylomastoid branch of the posterior auricular, deep auricular and anterior tympanic branches from the maxillary artery. Venous drainage includes the external jugular from veins on the superficial aspect of the tympanic membrane and veins from the deep surface of the tympanic membrane draining to the transverse sinus and dural veins. Multiple structures are contained within the confines of the tympanic cavity (middle ear). 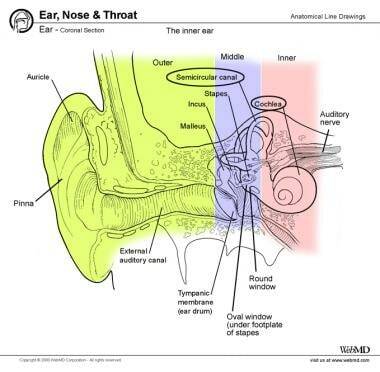 Muscles, nerves, and the auditory tube occupy space within the tympanic cavity. The cavity is covered in mucoperiosteum. The middle ear ossicles. Inf = inferior; Lat = lateral; Med = medial; Sup = superior. These bony elements serve to transmit and amplify sound waves from the air to the perilymph of the internal ear. Sound waves transmitted to the tympanic membrane push it medially, the malleus pulls the incus laterally through its synovial joint, the incus then causes the footplate of the stapes to displace the oval window (the fenestra vestibuli), causing a pressure wave in the fluid of the inner ear. This bony conduction amplifies 10 times the sound wave from air. The auditory tube (eustachian tube) is the communication between the middle ear and the nasopharynx. Its function is to equalize pressure across the tympanic membrane. Contraction of the tensor veli palatini and the salpingopharyngeus outside of the tympanic cavity (middle ear) dilate and open the auditory tube (see the image below). Important musculature in the middle ear (tympanic cavity) includes the stapedius muscle, which connects the neck of the stapes to the posterior tympanum. Innervation is provided by the nerve to the stapedius from the facial nerve. Contraction displaces the stapes posteriorly and functions to prevent loud noises from injuring the inner ear. Facial nerve paralysis causes uninhibited movement of the stapes footplate, with sound transmission causing acuteness of hearing, which can then cause damage to the inner ear. 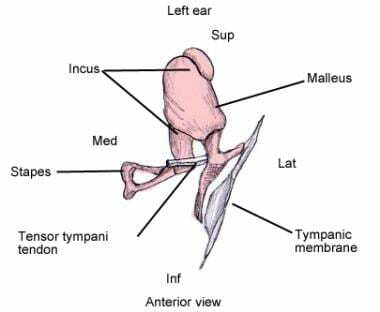 The tendon of the tensor tympani attaches to the manubrium of the malleus. Its muscle belly lies in a semicanal superior to the auditory tube. Innervated by the mandibular branch of the trigeminal nerve, contraction of the tensor tympani displaces the malleus (and the tympanic membrane) medially, thus tensing the tympanic membrane and dampening sound vibration as well. This muscle lies within the temporal bone in a plane along the superior aspect of the auditory tube. The horizontal portion of the facial nerve traverses through the tympanic cavity on its labyrinthine wall in a bony canal just superior to the footplate of the stapes. The chorda tympani, a recurrent branch of the facial nerve, is given off before the facial nerve exits the stylomastoid foramen. It enters the tympanic cavity (middle ear) after exiting a bony canal and passing medial to the neck of the malleus invested in the mucous membrane, then it emerges in the carotid wall. The chorda tympani innervates the submandibular and sublingual salivary glands and the anterior two thirds of the tongue (carrying taste information). The tympanic plexus then supplies branches to the mucous membrane of the tympanic cavity (middle ear), the fenestra vestibuli and auditory tube, in addition to other regions. The arterial supply of the cavity includes the tympanic branch of the maxillary (tympanic membrane), stylomastoid branch of the posterior auricular (posterior cavity and mastoid), petrosal branch of the middle meningeal, branch of the ascending pharyngeal, tympanic branch of the internal carotid, and a branch from the artery of the pterygoid canal (follows the auditory tube). Venous drainage is to the pterygoid plexus and the superior petrosal sinus. The inner ear, also called the labyrinthine cavity, functions to conduct sound to the central nervous system (CNS) as well as to assist in balance (see the first image below). Auditory transduction, the conversion of acoustic (mechanical) energy to electrochemical energy, takes place within the labyrinthine cavity (see the second image below). 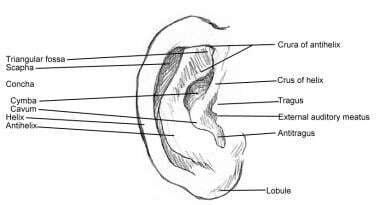 Inner ear in relation to middle and external ear. The labyrinthine cavity is essentially formed of the membranous labyrinth encased in the bony osseus labyrinth (see the following image). The osseus labyrinth is a series of bony cavities within the petrous temporal bone; the membranous labyrinth is the communicating membranous sacs and ducts housed within the osseus labyrinth. The membranous labyrinth is cushioned by the surrounding perilymph and contains the endolymph within its confines. The membranous labyrinth also has cochlear, vestibular, and semicircular components. 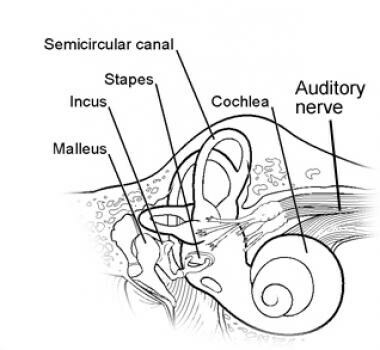 The osseus labyrinth consists of the cochlea, vestibule, and semicircular canals (see the image below). These bony cavities are lined with periosteum and contain perilymph. The fenestra vestibuli or oval window is an opening in the lateral wall of the vestibule of the osseous (bony) labyrinth. It articulates with the footplate of the stapes from the middle ear and opens into the fluid-filled inner ear. 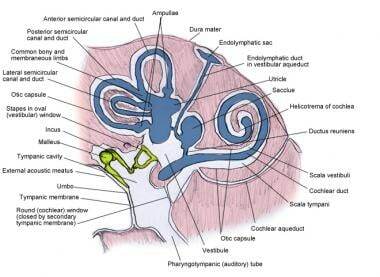 The vestibular apparatus is the membranous vestibule and is composed of the utricle and saccule. These "otolithic organs" sense linear acceleration in the horizontal and vertical planes. 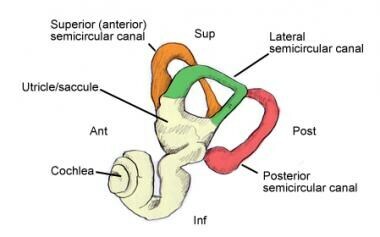 The utricle is closer in proximity to the semicircular canals, and the saccule is close to the cochlea. The orientation of the utricle is largely axial and registers acceleration in the horizontal plane. Conversely, the saccule is oriented in a coronal plane and senses acceleration in a vertical plane. The saccule is connected to the cochlear duct via the ductus reuniens and to the utricle by the utriculosaccular duct. The endolymphatic duct is a branch of the utriculosaccular duct and terminates as a dilated endolymphatic sac. The endolymphatic duct and sac play an important role in the uptake and removal of endolymph. Within these organs are hair cells (the saccule macula and utricle macula); the cilia of these cells are intricately associated with a membranous substance containing calcium carbonate granules, or "otoliths." Movement of the head induces shearing of the hair cells by the mobile otoliths. This directional change is sensed by the brain via the superior division of the vestibular nerve at the utricle and via the inferior division of the vestibular nerve to the saccule. Together, the otolithic organ organs of both ears are of prime importance in directional sensation. There are 3 bony semicircular canals; each stands at right angles to the other 2 canals. The superior, posterior, and lateral semicircular canals sit behind and superior to the vestibule (see the following image). At one end of each canal is the ampulla, a dilatation of the end. These canals open into the vestibule (utricle) via 5 ampullae. Inner ear. Ant = anterior; Inf = inferior; Lat = lateral; Sup = superior. The superior canal is positioned vertically; its lateral end is ampullated and communicates with the upper vestibule, whereas the opposite end joins the upper posterior canal at the crus commune, which opens into the upper medial vestibule. 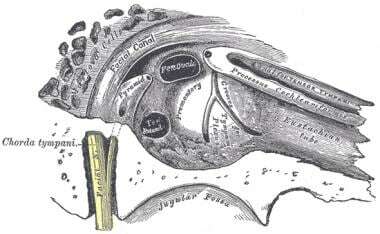 The posterior canal parallels the posterior petrous temporal bone; its lower end, the ampullated end, opens into the lower vestibule, whereas the upper end joins the crus commune. The lateral canal is directed horizontally, and its ampullated end opens to the upper and lateral vestibule, whereas the opposite end opens to the upper posterior vestibule. As noted earlier, each canal is positioned perpendicular to the others. The membranous canals are similarly termed superior, posterior, and lateral. Their functionality includes the ability to sense rotational velocity in 3 dimensions. This function is achieved via the cristae ampullaris, mechanoreceptors within the confines of the membranous ampullae. The endolymphatic flow changes within the substance of the semicircular canals are sensed by these mechanoreceptors, and this information is transmitted to the vestibular nerve. This ability to detect angular acceleration in 3 dimensions is critical for maintaining balance. 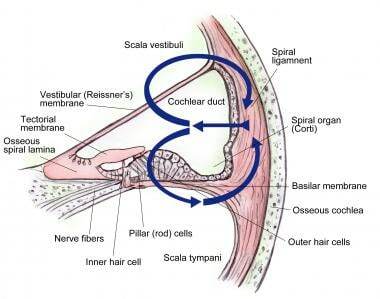 The cochlea is the essential organ of hearing within the inner ear (see the image below). 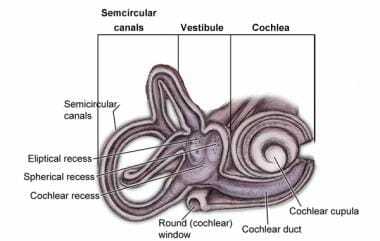 The osseus cochlea is shaped like a snail shell, with 2.5 turns of a canal coiled around the central modiolus. The bony cochlea communicates with the bony vestibule. Its base is perforated for transmission of filaments of the cochlear division of the vestibulocochlear nerve (cranial nerve VIII). Within the bony cochlea lies the membranous cochlea, wherein the energy of sound via pressure waves is transferred within the middle ear to the cochlear endolymph. The energy created within this liquid medium is converted to electrical energy that is transmitted to the CNS via the cochlear nerve. The cochlea is split into 3 chambers (see the following image below), the scala vestibuli, the cochlear duct, and the scala tympani. The scala vestibuli, or the superior chamber, is separated from cochlear duct by the vestibular membrane (Reissner membrane) and contains perilymph. This chamber originates in the vicinity of the oval window (which communicates with the middle ear and the footplate of the stapes) and spirals toward the apex of the modiolus, the helicotrema, where it communicates with the scala tympani. The cochlear duct, or the scala media, the central chamber, is well-defined by the vestibular membrane superiorly and the basilar membrane inferiorly. This membranous organ contains endolymph and the spiral organ (of Corti). The scala tympani, or the inferior chamber, is separated from the cochlear duct (above) by the basilar membrane and contains perilymph. In contrast to the scala vestibuli, the scala tympani commences at the apex of the modiolus, the helicotrema, and winds down to the round window (fenestra cochleae), which is covered by the secondary tympanic membrane. The round window opens to the middle ear (tympanic canal). Sound transduction occurs in the membranous cochlea via the spiral organ (of Corti). The spiral organ is composed of 4 rows of hair cells sitting on the basilar membrane. These hair cells have stereocilia branching outward into the gelatinous tectorial membrane (see the previous image). Sound transmission occurs after transmission to the middle ear via the tympanic membrane. Once the sound wave has been conducted via the osseus tympanic cavity (middle ear), the energy is transmitted by the footplate of the stapes displacing the oval window medially into the vestibule in the region of the base of the cochlea. Fluid then flows within the scala vestibuli of the cochlea, transmitting pressure to the basilar membrane; eventually, the flow proceeds to the scala tympani, displacing the round window membrane back into the middle ear. This perilymph flow within the cochlea leads to mobility of the hair cells of the spiral organ. The basilar lamina, when uncoiled, has an apex and base; the apex is wider than the base (see the image below). Acoustic stimulation travels from the base to the apex, with higher frequency stimuli causing excitation at the base, low frequency at the apex. The information transmitted by the hair cells within the spiral organ to the cell bodies, spiral ganglion, of the cochlear nerve. These nerve endings exit on the modiolar side of the spiral organ. Higher frequencies stimulate the base of the cochlea, whereas lower frequencies stimulate the apex. The vestibulocochlear nerve (cranial nerve VIII) is the primary nerve of the inner ear. This nerve originates between the pons and medulla oblongata in the brain and passes into the petrous temporal bone through the internal acoustic meatus. It is within the temporal bone that the nerve divides into superior and inferior vestibular nerves as well as a cochlear branch. The vestibular nerves carry information from the saccule, utricle, and ampullae by way of the vestibular (Scarpa) ganglion. Sound information is transmitted through the spiral ganglion to the cochlear nerve from the cochlea. Variant anatomy of the external ear can be divided into congenital and acquired entities. Acquired entities can further be delineated into intrinsic processes, such as cancer, and extrinsic processes, such as trauma. Humid conditions and swimming in contaminated water can predispose patients to infections of the external ear, otitis externa. Tympanic membrane perforations are not uncommon and usually occur within the pars tensa. Small, central perforations often heal without significant sequela; however, marginal perforations that don’t heal can lead to growth of skin from the ear canal into the middle ear. Large, nonhealing perforations decrease the surface area of the tympanic membrane, leading to impaired acoustic collection. Many etiologies of tympanic membrane perforation exist, including foreign body introduction (ie, pencil/cotton applicator), sparks from welding in industrial settings. Explosions can also cause intense pressure and perforation to the tympanic membrane. In addition, deep-sea divers and miners are at risk for middle ear hemorrhage and tympanic membrane perforation when descending from/ascending to the surface rapidly. Acute and chronic inflammation of the middle ear lining, otitis media, can lead to severe swelling and subsequent necrosis and perforation of the tympanic membrane, allowing spontaneous drainage of fluid (usually pus). Chronic inflammation can lead to irreversible scarring of the tympanic membrane, termed tympanosclerosis, leading to poor mobility of the tympanic membrane and poor sound conduction. Chronic fluid and inflammation in the middle ear worsens hearing and can interfere with language skills, often seen in children with auditory tube dysfunction. Bone formation around the ossicular chain of the middle ear can lead to poor mobility of the joints, specifically the stapes and oval window. This leads to discontinuity of the ossicular chain of the middle ear with the inner ear, creating progressive conductive hearing loss. This condition is termed otosclerosis. 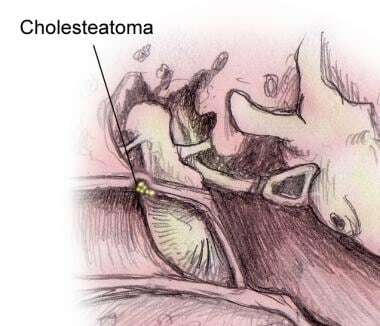 Benign epidermoid tumors, cholesteatomas (see the image below), can occur in the middle ear and mastoid. These traditionally form from acquired etiologies such as tympanic membrane perforations, with the skin healing into the middle ear and chronic auditory tube dysfunction. These can also arise from congenital skin remnants in the middle ear. Cholesteatomas are not malignant, but they become problematic, as they are locally destructive secondary to erosion and the dead debris that accumulates, and they can become a nidus for infection. Inner ear dysfunction can occur secondary to congenital etiologies such as rubella. Pregnant mothers can contract this virus, leading to destruction of the developing fetal cochlea and subsequent deafness. Acquired measles and mumps can also lead to cochlear damage and childhood deafness. Meningitis can produce inner ear pathology and symptoms as a consequence of communication between the perilymph of the inner ear and cerebrospinal fluid. The cochlea can be destroyed, eventually leading to permanent deafness. Meniere disease and Meniere syndrome are pathologic entities that are incurred as a result of an inflammatory response and endolymphatic accumulation in excess, endolymphatic hydrops. This endolymphatic hydrops and subsequent increased pressure leads to episodic hearing loss, tinnitus, severe vertigo, and a sense of fullness in the ear. Increasing endolymphatic pressure ruptures the lining of the membranous labyrinth, creating an avenue for mixture of endolymph and perilymph and subsequent permanent hearing loss. The disease and syndrome are differentiated by idiopathic etiology (disease) versus excess endolymphatic accumulation secondary to increased production or decreased resorption (syndrome). Benign paroxysmal positional vertigo (BPPV) is a pathologic disorder of the inner ear. Patients traditionally experience repetitive episodes of vertigo incurred after changes in head position relative to gravity. The pathologic mechanism is thought to be caused by dislodgement of the otoconia, "ear rocks," within the utricle. The mobilized otoconia, crystals made of calcium carbonate, migrate into the semicircular canals. Head reorientation relative to gravity induces movement of these crystals within the semicircular canal, inducing endolymphatic fluid displacement and the sensation of vertigo. This disorder can be diagnosed with the Dix-Hallpike maneuver, which reorients the head to align the posterior canal with gravitational forces, provoking the classic positional vertigo. Hair cells often degenerate with age, a condition known as presbycusis. This gradual hearing loss is varied amongst individuals with regard to severity. Hearing loss can also be spurred by prolonged sound exposure greater than 85 decibels (dB), such as that in industrial settings. Prolonged exposure exhausts ear hair cells, with eventual irreversible hair cell injury. Head injuries deserve mention as well. Temporal bone fractures can produce middle ear pathology and conductive hearing loss. Disruption of the cochlea can occur, leading to sensorineural hearing loss. Hansen JT, Lambert DR, eds. Netter's Clinical Anatomy (Netter Basic Science). Philadelphia, Pa: Saunders; 2005. Netter F, Hansen J. Atlas of Human Anatomy. 3rd ed. Teterboro, NJ: ICON Learning Systems; 2003. Gray H. Howden R, Pick TP, eds. Grays Anatomy: Anatomy Descriptive and Surgical. 15th ed. London, UK: Longmans Green & Co; 1995. Park HS, Chung MS, Shin DS, Jung YW, Park JS. Accessible and Informative Sectioned Images, Color-Coded Images, and Surface Models of the Ear. Anat Rec (Hoboken). 2013 May 27. [Medline]. Blackbourne LH, Antevil J, Moore C, eds. Anatomy Recall. Philadelphia, Pa: Lippincott Williams & Wilkins; 2000. Kahrs LA, Labadie RF. Freely-Available, True-Color Volume Rendering Software and Cryohistology Data Sets for Virtual Exploration of the Temporal Bone Anatomy. ORL J Otorhinolaryngol Relat Spec. 2013 May 9. 75(1):46-53. [Medline]. Khan S, Chang R. Anatomy of the vestibular system: A review. NeuroRehabilitation. 2013 Jan 1. 32(3):437-43. [Medline]. F. Paulsen. Ear. Sobotta Atlas of Human Anatomy. 23rd. Elsevier GmbH; 2010. 3: 133-160. Carlo P. Honrado MD, Dewayne T. Bradley MD and Wayne F. Larrabee MD. Embryology of the External Ear. Babk Azizzadeh MD, Mark Murphy MD, and Calvin Johnson MD. Master Techniques in Facial Rejuvenation. Saunders; 2007. 17-32. Kathleen C.Y. Sie, Amit D. Bhrany and Craig S. Murakami. Microtia Reconstruction. Flint, Paul W., MD. Cummings Otolaryngology. 6. Saunders, Elsevier Inc.; Copyright 2015. George D. Harris. 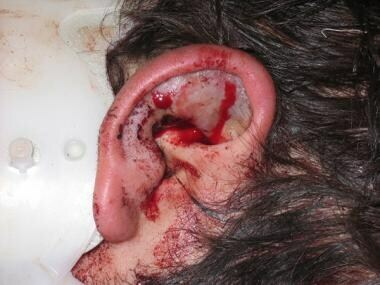 Auricular Hematoma Evacuation. John L. Pfenninger MD and Grant C. Fowler MD. Pfenninger and Fowler's Procedures for Primary Care. 3rd. Mosby, Inc, an affiliate of Elsevier; 2011, 2003, 1994: 459-462.